Bill Clinton may have emerged from Hempstead County, but the biggest thing in south west Arkansas nowadays is giant tracks from the Cretaceous, 120 million years ago. Acrocanthosaurus atokensis is one of the largest carnivores that ever existed. 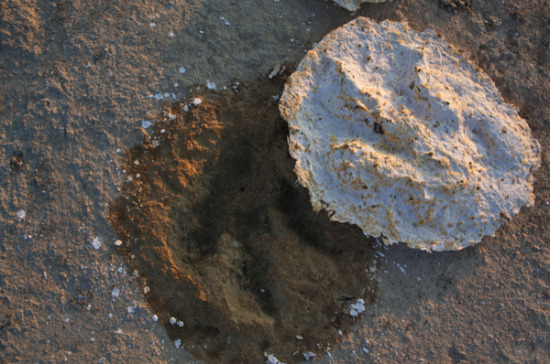 It is likely that the 60 cm x 30 cm footprint fit its profile, perfectly preserved in the desert-like Cretaceous mud. Amazing though that is, this site reveals even bigger feet from even larger animals. The suspect is either Pleurocoelus or Paluxysaurus, both of them herbivorous Sauropods. It sounds like a walk in the park for the dinosaurs and scientists flocking there from the Universities of Kansas and Arkansas and the J. William Fulbright Academy of Arts and Sciences to sort out what or who tried to run the state many years ago! "Through tracks, we can learn all sorts things about dinosaur biomechanics and behaviour," said Brian Platt of the University of Kansas. "Dinosaur bones can be dragged away by animals or swept out to sea. But we know that about 120 million years ago, dinosaurs walked right through here." The Z+F Imager 5006i is a phase-based scanner using a laser which sweeps the whole landscape recording 500,000 points per second. The Leica ScanStation C10 is a time-of-flight scanner, sending discrete pulses of laser light at 50,000 a second, mounted on the ridge above the site. Up to 4 return pulses from each point can be received. Then the LiDAR's return pulses can be located, enabling a 3D scan to be produced. The other researchers have less complex technology. Huge brooms and tiny chisels are used to clean up the footprints and dollops of plaster are laid to make casts of the prints. Using all of the advanced technologies, however, detailed measurements of the track-ways and the prints will reveal ID, movement , and behavioural traits of the various (and some unknown) species. Climate in the Cretaceous was hot and salty, like the Persian Gulf, according to the National Science Foundation's Stephen K. Boss. Rock samples have revealed this, while the fact that the site was exposed to the elements means that the frequency of rain and rate of evaporation can be estimated. The regional palaeo-climate, once known, will help predict our future climate too. How these animals lived and why so many occurred there at that time is also intriguing to those who managed to conduct such research within a two week spell, thanks to the funding.